This is one of the recipes in a yet-to-be-published book tentatively titled “3-Ingredient Low Carb Breakfasts”. The photo you see below is an experiment with different variations. All of which were delish, but had more than three ingredients. There are endless variations of this recipe. Try a flavored cream cheese, Rondelle, Boursin, or herbed goat cheese. Cut the avocado in half and remove the pit. In a small food processor pulse the rest of the ingredients until coarsely chopped. 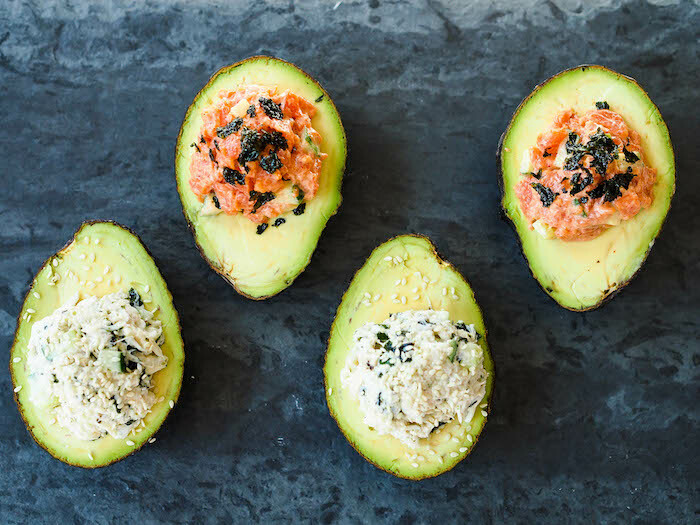 Place the salmon cream inside the avocado. Serve immediately.